Click on the application to download. All PUSD students entering 9th grade enrolling at PHS are eligible to apply to the Engineering Academy. New students enrolling in 10th grade are also eligible. Students entering the Academy in 11th grade will have to make a significant effort to meet all requirements in two years. Engineering Pathway students do not need to apply to the Pathway, but should work closely with their counselors to develop the plan of their choice. All PHS students not part of the Engineering Academy are part of the Pathway, and can register for any engineering course that is part of the Academy. Eligible students may apply to the Engineering Academy during the course registration process. Engineering Academy applications may be obtained here on the website, from middle or high school counselors, or by using the application included on this website. Returning students are guaranteed acceptance, provided they have met the requirements for academic and behavior standards listed on this website. If a student is transferring from another school, a transfer acceptance from PUSD will also be necessary to attend Poway High School. This document may be obtained through the PUSD District Office. Transfer students must fulfill the requirements of the transfer. Complete the Engineering Academy application and submit it to your counselor. All applications will be accepted on a first come, first served basis. Applications will be processed and parents will be notified of acceptance into the Engineering Academy. Students must earn a “C” grade or better in each engineering course. Students that earn a “D” grade or below will be removed from the Academy. The Academic Standards requirements listed must be fulfilled. While enrolled in the Engineering Academy the student will develop a portfolio to be used for college and/or job applications. Remember that we have three pathways, which include Engineering, Architecture and Computer Science. Because of how much writing we do in the class, Business is a very natural direction for a student, in which we have three students with a business major. All courses are articulated with the University of California and California State University System. All foundation, specialization and capstone courses can receive transferable college credit. This can save you thousands of dollars in college. See College Credit. The Engineering Academy at PHS is a program designed to give students an opportunity to sample engineering classes while still at the high school level. The courses are designed to give students a true taste of the world of engineering. Most of the work is project-based and nearly all projects are collaborative in nature. In order to protect this model in the classroom certain behavior and academic standards are needed. Students are expected to pass all Academy classes each grading period with a ‘C’ or better. Data shows that virtually all students that fail a grading period do so because of missing assignments. Therefore, it is required of all students to turn in every assignment. Failing to do so could result in the loss of Academy status. Students are expected to foster a collaborative learning environment. Disruptive behavior will not be tolerated. Students are expected to live by all PHS policies and rules. Inter-District Transfers: Once an IDT has been approved, you will need to complete the four enrollment steps - SEE NEW STUDENT ENROLLMENT (PHS). If you live outside the Poway Unified School District boundary and want to attend Poway High, you will need to apply for an Inter-District Transfer. If your request is for the current school year, applications are answered within 30 days of submission. If your request is for the 2017-18 school year, applications will be answered within 14 days of the first day of school. Please follow the links below to access all of the required documents and procedures for enrollment. Click HERE to access the PUSD New Student Enrollment page, which includes required documents and procedures for enrollment. 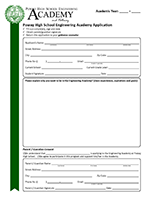 Prior to completing all of the required Enrollment documents, email Rodger Dohm, Engineering Academy Coordinatior with the completed Engineering Academy Application at rdohm@powayusd.com. Once an IDT has been approved, you will need to complete the four enrollment steps - SEE NEW STUDENT ENROLLMENT (PHS). Transfers for grades 9 – 12 may result in the student being ineligible to play CIF sports for a period of time. Eligibility determinations are subject to the rules of the San Diego Section of the California Interscholastic Federation (CIF-SDS) and its member conferences and leagues. If you should have any questions regarding eligibility, the phone number for CIF-SDS is (619) 292-8165. Copyright © 2013 Poway High School. All Rights Reserved.